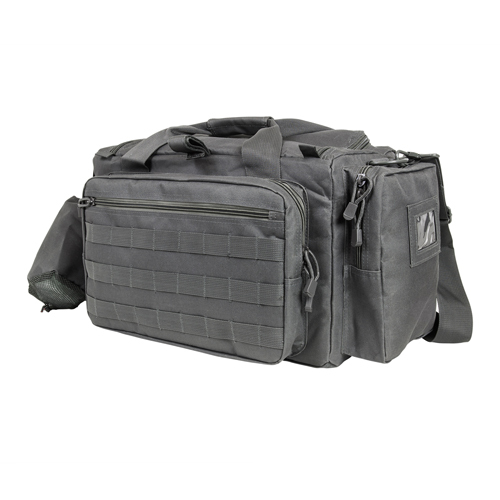 Main Zippered Center Compartment (7W X 15LX 10H) with: two each internal End Pockets with Velcro Flaps and two each long Padded Side Pockets perfect for storing handguns. Heavy Duty Metal Zipper Tabs have Grommets for a small pad-lock (not included) to lock the compartment and help secure your gear. Main cover has Velcro patch for Patches and Name Tape and a Top Velcro Loop for Securing Hearing Protection for easy access when at the shooting range. Front padded compartment can help keep your magazines organized. Internal Elastic Loops can hold up to 8 each AR15 magazines or up to 16 each double stack Pistol magazines and a separate internal Padded Pocket. Loop Velcro patch sewn onto the front face of the compartment for Patches and Name Tape. Rear Padded Compartment can hold more of your gear and magazines. More Internal Elastic Loops for up to 4 each AR15 or 8 each double stack Pistol magazines. Front zippered Pockets for storing paperwork, pen, markers, and score sheets. Side Padded Compartment with ID Card Window for storing your shot timer, eye protection, and other gear. Internal Elastic Loops for up to 2 more AR15 magazines or up to 4 each double stack Pistol magazines. Side Beverage Pocket with an adjustable bungee and Velcro strap. Includes a Brass Bag with an Adjustable Top Draw String, a Metal Clasp Hook, and with a Mesh Bottom Netting to sift the dirt from your brass. Large Metal D-Rings on the ends of the Competition Range Bag. Wide Padded Shoulder Strap with Metal Clasp Hook.